I’ve started working on a new project, to shoot down quadcopters and drones, primarily using an Xbox 360 Kinect. The idea started as a joke back in 2014, shortly after Amazon released its Amazon Prime Air video that went viral. A friend and I came up with the idea, as a joke, of course, to go after the drones for their items. Finally, a few weeks ago, I remembered that idea and thought it would be fun to build it. Although it isn’t finished yet, it uses 2 nema 23 stepper motors, 2 stepper motor drivers, an Arduino Mega(way overkill) and a 24V 10A power supply. I had all these laying around from a previous project which didn’t work out. Eventually, I plan on attaching an EMP device, although the original plan was to use a HERF gun. The reason I changed my mind is because an EMP isn’t harmful against humans, and also allows me to release a lot of energy in a burst. Also, I’m going to mount a Mini ITX board on it, because right now I have to connect it to my desktop whenever I want to use it. I wrote the code from scratch in C#. It communicates via Serial to the Arduino and uses the Kinect SDK. Furthermore, it has a graphical interface that allows me to see what the kinect sees, and also shows if it’s moving up, down, left, right, or is in the correct position already. Basically, it finds the object that is closest that is still within $minDist and $maxDist, and moves the Kinect accordingly so it is within $threshold of the center. These are the only 3 configurable variables. I designed the frame myself, and 3D printed it. The frame mounts onto a large wooden stand that I found in my basement. It’s very sturdy, and if a part ever breaks, I can just print a new one! The total cost of this project, so far, would be around $150, but with more appropriately sized parts, it would be possible for less than $75. These figures are in CAD and they only include the electronics/the motors. Of course, the EMP device is what will cost the most, due to the capacitor bank it will need. I don’t ever plan on using this on drones, because that would be extremely illegal and a terrible idea in general. This is nothing more than a proof of concept and should not be attempted. Here are some pictures and a video in operation. Due to the clutter in my room, it kept losing focus on me. Outdoors, it works much better, which is where it will be operated anyway. Update: I have uploaded all the files to github. Currently, it is going through a major redesign. Also, I’ve created a page on Hackaday.io. 3D printers are amazing machines. They can take spools of plastic, and make virtually anything you want. But the real question is, can they cook toast? Hi all. I had an old heated bed and matching glass that I temporarily used when my 3D printer was out of order. In theory, it could reach a temperature of 130C. Would this be enough to toast bread? I attached some spade connectors onto the heated bed wires, which I had attached previously. Connecting the whole thing to a SLA battery, I could quickly feel it heating up. I used a piece of glass to keep it from heating up the counter top too much. After leaving it on the bed for around 20 minutes – 10 minutes on each side – I tried out the toast. It was warm on the outside, but the inside was still ice cold. So, unfortunately, I ended up with only slightly toasted bread. If I wanted to improve upon my toaster, I would sandwich the toast between 2 heated beds, and I would put something heavy, like a brick, on the top. This would ensure good thermal contact, and would also keep the heat in. I think it could have worked out that way, and it would half the toasting time – the bread wouldn’t have to be flipped. 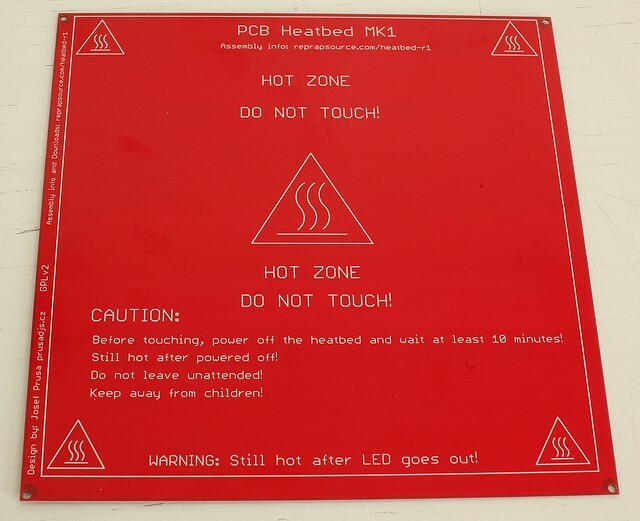 The heated bed I used. I bought a 3D printer! I purchased it from Newegg. With tax and shipping, it cost roughly $588. I got the Davinci 1.0a. According to the internet, it has a few minor problems that could easily be fixed. When I got mine, I didn’t have any problems and it worked perfectly. Still, I installed Repetier firmware so I could use my own filament rolls. I have ordered a 1kg each of red, orange, green, and glow in the dark filament. Already, I’ve printed out a calibration board, a key chain, a pan/tilt servo camera mount, and replacement parts for the 3D printer in case it breaks. Currently, I am printing a spool holder for the extra spools, which are supposed to arrive tomorrow. Posted on March 31, 2015 Leave a comment on I Got a 3D Printer! Hey all! A got a Chromecast for Christmas, which I was happy about, but my projector doesn’t have an HDMI port. Doing some research, it seemed nobody documented which adapters do and do not work with the Chromecast. I found a cheap $10 one on Ebay, pictured above. It has no power input, which worried me, because that often means it is not an ‘active’ type converter. It came in the mail today. I hooked everything up, and sure enough, it worked! I’m linking the actual Ebay item, so you can buy the same one and be sure it works. Hi all! Sorry I haven’t posted in months, I’ve been really busy with various things! I ordered a solid state relay off of Ebay for my project, which I’ll post on here when it’s done. It worked fine for a couple of days, but eventually, it failed in the open position. I used plenty of thermal paste, a large heat sink, and all I was driving was some christmas lights, so I was sure it wasn’t me. Either way, I contacted the seller and they sent me a new one for free. Opening the dead relay was harder than I expected. In the end, I had to chip away at the plastic until it came off. It took about half an hour in total. I couldn’t get it apart any more than I did, because the whole thing is covered in a weird solidified goop. It doesn’t look as unsafe as some people say about Ebay relays. The low voltage side and high voltage side are far apart. The high voltage side has traces that definitely can support 25 amps, which is what the relay is rated for. I tried to get the triac off to see if it had thermal paste behind it, and to see if it had anything visibly wrong with it, but the gunk was in the screw and I couldn’t get it out, unfortunately. Pictures of the inside below. The bottom of the PCB. The right is the load/high voltage side. The left is the input/low voltage side. See the lines in the solder on the right? That’s where 2 of the triac terminals went, far from each other and far from the low voltage side. The top of the board, covered in solidified goop. Left is low voltage, right is high voltage. The bottom of the relay. The triac is mounted on it. It’s made out of metal, but it’s hard to tell with all the goop on it.